The annual AIR MILES Shop the Block event launched on November 14 and presents a really nice bonus mile earning opportunity. If you meet the requirement of using Shop the Block coupons at 3 or more sponsors you'll be awarded with up to 2,000 Rewards Miles over and above the base miles and coupon bonus miles awarded. Now to earn the bonus won't come cheap if you don't have any planned shopping this month at the participating sponsors. 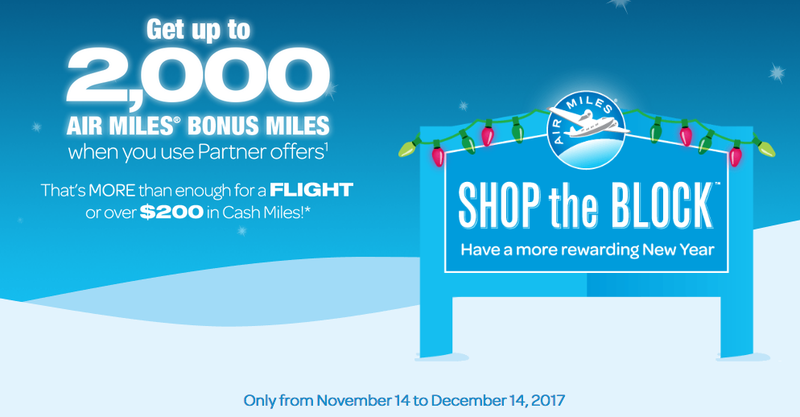 On the other hand if you do or can move shopping from one retailer to another that is an AIR MILES Sponsor than you can earn those bonus miles for your everyday regular spending. If you have a BMO or American Express AIR MILES Credit Card achieving the bonus can be easier as it will count as one offer if you make 25 or more in-store purchases on one of the cards. That's $220 in spending to earn the 2,000 Bonus Shop the Block Miles but then you have to add in your base amount miles plus the coupon bonuses for an additional ~150 miles or so for 2,150 bonus miles in total. We value AIR MILES Rewards Miles at an average of 13 cents each for travel, so you are getting back $280 on your $220 in spending, that is a great return! If you strictly earn cash rewards, then you are looking at a return of about $226, still pretty decent for spending $220. For some of you it may take more spending but as we mentioned before if this is shopping you are already planning on doing then jump on the Mega Miles event right away so that you can earn this bonus. • New American Express® AIR MILES®* Platinum Credit Card Cardmembers, earn a bonus of 2,000 AIR MILES®* Reward Miles when you charge a total of $1,500 in purchases to your Card within your first three months of Cardmembership. That's enough for a select flight.